^ 1.0 1.1 Moskowitz, Clara. Hubble Telescope Reveals Farthest View Into Universe Ever. Space.com. September 25, 2012 [September 26, 2012]. 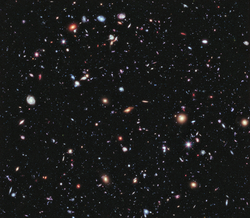 ^ 2.0 2.1 Hubble Goes to the eXtreme to Assemble Farthest-Ever View of the Universe. NASA. 25 September 2012 [26 September 2012]. ^ New 'extreme' Hubble telescope shows deepest view yet of night sky. The Times of India. 26 September 2012 [26 September 2012]. （原始内容存档于2012年9月26日）.